I hand plane my shafts from white pine or I harvest shoot shafts from nature. More on my site. I make most of mine out of 3/8" dowels of one kind or another turned down to the spine I want, and weight matched by tapering. I use cedar, old stock Acme’s, Doug Fir from Surewood and stika spruce. I have used bamboo, maple, hexshafts, and some others I can’t recall. Presently I am working off the cedars. These days I spray the cap. My feathers and cap combo is what I am in mood for. I made these blue ones cause blue isn’t a natural color so if one goes AWOL I can find it easier. You can make your own shafting but if you are just starting out on your wood journey buy your shafts. I traded turkey feathers for hundreds of shafts over the years. Some woods are problematical and don't stay straight. This doesn't mean every shaft out of a dozen will give you problems but enough will to turn you against them. The ones I found that won't stay straight; ash, birch, river cane, some poplar and hickory. Almost all shafts will need some initial straightening, some will need a little tweaking down the road as finished arrows. I like doug fir, cedar, and have made more arrows out of lodgepole pine (chundo) than anything else. I understand sitka spruce makes good shafting but I haven't used it. My advice it to go over to Sherwood Shafts and buy quality shafting to start out, you won't be disappointed and will find success on your first attempt. I like Ash and Hickory shafts but I shoot heavier bows too. That doesn't mean you can't or shouldn't try them. You may like them. They can be a bit fussier to keep straight but they are VERY durable and have good weight. I'm not sure who has good Ash and Hickory shafts now. I think though, that Douglas Fir is the best all-around arrow wood on the market, given the spotty nature of POC availability and its tendency to break. Surewood Shafts is doing great things with their Doug Fir. The only thing about Fir is it can be difficult to cut point tapers without a power sander but they are great shafts. I still have some Doug Fir from 20 years ago and they are still good arrows. Hard Rock Maple shafts sourced through Kevin Forrester and I do believe these are as (if not more) durable as some (but not all) CF shafts I've owned. I'm going to cut up a big smooth bark hickory tree tomorrow morning that fell a few days ago at my mom's place. I have several uses for it in mind, arrows being one of them. Yep Jinks, sugar maple is good too. To each their own, but I can't be happy just shooting cedars. I'll probably never buy em again. Too fragile for me. Jeff, they are as good as the person putting them together. I will admit Carbon takes a beating and can still go some more, but the flight and beauty of a wood is like no other. IF I had the time and patience to make good wood arrows I would not shoot anything else. That being typed, I am going back to Carbon this season. It's just easier. <--Terrible excuse but true. I make my own shafting with a dowelling jig built from Jim Davis's plans that he generously put out a while back. I use reclaimed fir, locally cut fir and larch and hemlock from local suppliers. They are finished with Minwax spar varnish, cut 40% with mineral spirits, and usually get wild turkey fletching. 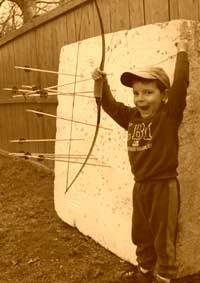 Building arrows and bows is a great way to pass the winters in N. Idaho. "To each their own, but I can't be happy just shooting cedars. I'll probably never buy em again. Too fragile for me." and Sitka Spruce?...is pretty much like shooting coat hanger wire...just look at it long enough and you can pretty much bend it with your mind! LOL! Sometimes I make my own shafts and sometimes I buy them. I've built arrows out of a lot of different woods, both softwoods and hardwoods. For hunting this year mine are port orford cedars. They're 11/32" and with a magnus 125gr classic broadhead weight approximately 560 grain. The nock is a bohning classic index nock. I've had my best luck and most satisfaction with Hex shafts and Surewood. Nowadays I shoot carbon because I can weight it like I need to and it's either straight or broken. If they get the Hexshafts up and going again and they have a good report then I may go that route again with a footed shaft. I still have one dozen Hex-pine shafts from the four dozen I bought years ago. They do make a nice shooting arrow. Cedar shafts from Wapiti. Very straight and consistent weight and spine. Hardwoods are fine if you dowel your own or buy your shafts. I can hand plane a white pine arrow in 20 minutes compared to 40 minutes for a hickory arrow. They are not worth the extra time. I was asked to show those blue arrows finished. I maybe making some next month. Just bounced 2 off the rocks this AM. IMO making our own arrows wheather we buy the components or make them ourselves shows how creative we can be. Even a guy like me who calls stick people “art” can make arrows that will pass muster. Now I know some will say a dead critter is dead no matter how pretty the arrow. But for me it’s a labor of love. I order cedar from wapiti mostly. I have used a variety of wood shafts over the years as well. I currently have about three dozen POC some of which I got from Rogue River and lately Wapiti. Very satisfied with their shafts. I have about a dozen ash shafted arrows that originally came from Silent Pond through Madbury Arrow Works many years ago. And I have a dozen more in the making right now using ash from the same source. I have never had any of the problems with ash that many people complain about. I have had to straighten some of the shafts while making the arrows. But once they are finished and sealed I never had a problem. These I have are twenty years old. And ash arrows can sure take a pounding. Isould love to get my hands on some more. I have also tried the hex shafts (still have a dozen unfinished), chundoo and douglas fir over the years. For whatever reason I never stuck with any of them. POC and ash are my preferred choices.